It's not everyday that 2 mega companies join forces to produce an event so big that it had to have extra time added to it. 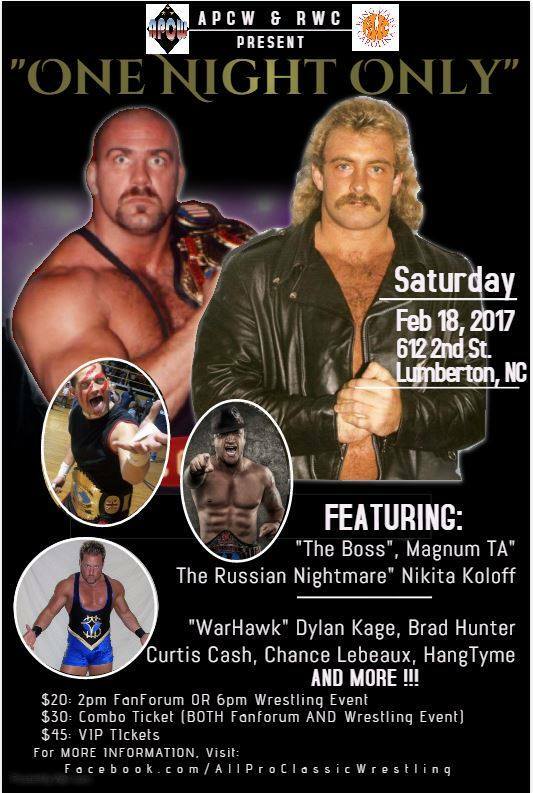 ACPW and RWC have joined forces to give the fans "One Night Only" with "The Boss" Magnum TA & "The Russian Nightmare" Nikita Koloff! This is just what the title says, 1 nite only! See you there! For more info reach out to "AllProclassicwrestling on Facebook! Upcoming Event: March 4, 2017 "MADNESS"
Show results: "Refocus & Full Throttle"